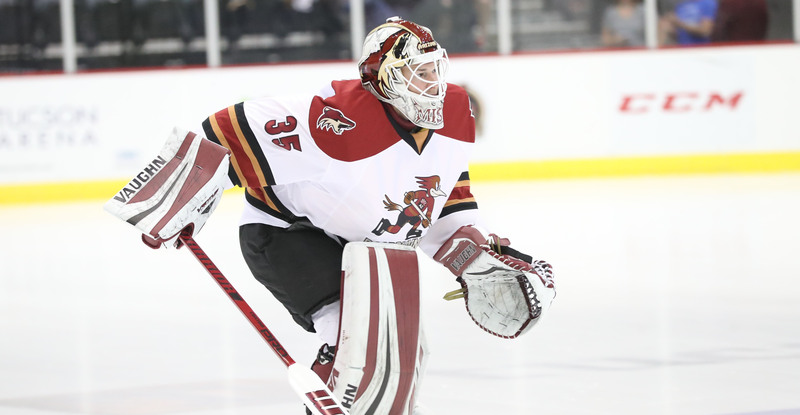 TUCSON, AZ – The Tucson Roadrunners, proud American Hockey League affiliate of the Arizona Coyotes, shared information regarding two goaltender transactions on Monday. Hunter Miska, 22, has been recalled by the Arizona Coyotes, the first recall of his professional career. This season the rookie from the University of Minnesota-Duluth posted a record of 3-0-0 in four starts with the Roadrunners. The Stacy, Minnesota-born product finished with a 27-5-5 record, a 2.20 goals against average, a .920 save percentage and five shutouts for the Bulldogs (NCHC) in 2016-17. Miska helped lead the team to the Frozen Four Championship game and was named a finalist for the Mike Richter award, which is given annually to the goaltender voted to be the most outstanding in Division I NCAA Hockey. Michael Houser, 25, was assigned back to the Fort Wayne Komets. The Youngstown, Ohio native was recalled by the Roadrunners on Saturday and dressed as the backup in the team’s 5-4 OT victory over the Iowa Wild.